If you are like most homeowners, you may have repainted one or more rooms in your home over the years in an effort to keep your home looking great. Now that the time has come to repaint your home's exterior, you may be thinking about tackling this project on your own as well. 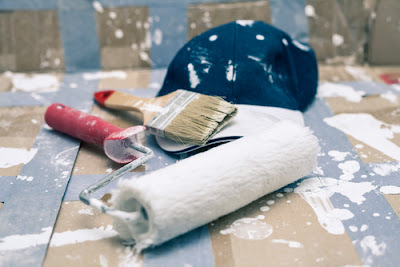 While painting the interior and exterior of a home seem like similar types of projects, they actually are rather different in a few key areas. There are a few key reasons why it is best to let a professional paint your home. There is preparatory work required for both interior and exterior painting projects, but the scope of the work for the exterior is different. When preparing to paint the exterior, you may need to scrape away peeling paint, replace some boards and siding, re-caulk all of the surfaces and complete other steps. You may also need to add a coat of primer to the surface so that the new paint will take well to the surface. These steps can take a considerable amount of time and energy, and in fact, you may find that the preparatory stages actually take as much time or even more time than applying the final coat of paint to the surfaces. It is important to take a closer look at the height of the surfaces that you will need access to and to think about the type of work that you need to do from that height. For example, to complete your painting project, you may need to scrape, caulk, prime and paint the top of the chimney, which may even exceed the top of your roof line at its peak. This may be 20, 30 or more feet in the air. Imagine standing on a ladder and holding onto the ladder with one hand while trying to complete this work and hold onto your paint can at the same time with the other hand. Clearly, this will require extra equipment, like scaffolding, in order to avoid injuring yourself, and scaffolding can be expensive to purchase and time consuming to erect and move around the house. The last thing you may want is for your home painting project to take several weekends or more to complete. Your curb appeal during this time may be lacking, and you may find that the weather interferes with your ability to get the job done around your own schedule as well. This is a project that may take several men in a painting crew several full days to complete, so you may find it takes you two to four times this amount of time to complete the work on your own. Keep in mind that skilled painters may be able to work more efficiently than you. 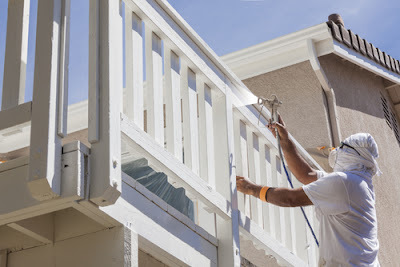 Exterior house painting is quite a significant undertaking, and you do not want to underestimate the scope of the work that is required to get the job done. Nor do you want to start a project that you cannot feasibly finish. While you may save money working on the project yourself, this is not always the case if you have to buy scaffolding and other equipment and supplies. If you are thinking about painting your home's exterior, take time to request a quote for professional painting services today. 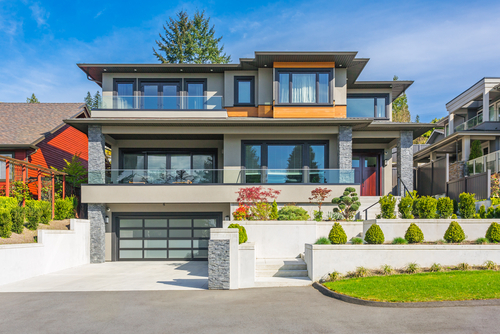 Why You Need High Quality Exterior House Painting? One of the best ways to give your house a fresh look and a face lift is by repainting its exterior. Just like a good cosmetic, high quality exterior house painting can hide the age of your house and the hairline cracks and stains that would show the number of years it has been battered by the elements of nature. High quality paint can cost a lot but if you want to eliminate the need of another painting job after a few years, stick with paint products that are known for their endurance and durability. Aside from aesthetics, here are other reasons for you to do that badly needed exterior house painting you have put off for a long time. First, high quality paint in the right color scheme can add value and beauty to your house. It is natural to feel proud of your house, which is probably your most valuable investment. Making it attractive and hearing people make positive comments about it can fatten one's heart and make him happy about life. Second, exterior house painting protects your house from the harsh elements of nature. The walls of your house can get damaged without any protection against the sun, rain, wind, dust, snow, and event hailstones. With high quality paint, water cannot penetrate the pores of the wall, preventing retention of moisture that can eventually weaken the material used and incur damage. Dust particles can easily be washed away from painted surfaces because they are glossy and smooth. The heat from the sun is barred by several coatings of paint, reducing weathering that can cause cement or concrete to crack and erode later. Third, a good coating of exterior house painting can fill thin cracks that can enlarge when left exposed to the elements. These tiny cracks will be closed, preventing water, dust particles, and other foreign bodies from entering and worsening your wall's condition. Wood is susceptible to these elements as well but a good coating of high quality paint can make a big difference. Last, high quality exterior house painting can increase the market value of your house if you want to sell it. Buyers will prefer a house that will not need repainting for several years. This means that they do not need to spend for the repainting job in the near future. This will help them save money, time, and effort. Remember that a good choice of color for your exterior house painting service can increase its market value. In the past, gray and other neutral colors are preferred but nowadays, people use colors that lend character to the house. Warm and cheerful colors are becoming popular as house owners realize how their choice of color can affect the ambience of their home. In addition, if you want to put your house in the market, you will have a better chance of selling it when the colors used to paint it are lively and cheerful.